If there is one ingredient that defines baking, I would argue that it is flour. Specifically, wheat flour. Sure, sugar is important for desserts and pastries, but flour is the backbone of most baked goods. Wheat flour is composed of proteins, starch, lipids, sugars and enzymes. The two most important of these components, the starch and the protein, form the “crumb” of a baked good. The crumb is a network of starch and protein interspersed with millions of tiny air bubbles. Wheat flour is about 70% starch. 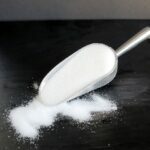 Starch granules absorb water from the batter, swell up, and gel. 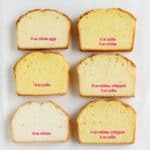 As an item bakes, the gelled starch sets to help form the physical structure of the baked good. Protein is the other major component of wheat flour. When a batter or dough is mixed, two proteins in the dry flour, glutenin and gliadin, absorb water and form gluten. Gluten is a network of coiled and folded protein strands. The stronger the gluten, the more water it will absorb. If you replace a low protein flour with an equal volume of high protein flour the batter will be much thicker, since the stronger gluten will absorb more of the available water. Using a higher protein flour changes the outcome of the recipe not only because the gluten is tougher, but also because there is less water available to the other ingredients in the batter or dough. The stronger the flour protein the more water it will absorb. As a batter or dough is mixed or kneaded the coiled and folded strands of gluten begin to align and tighten. 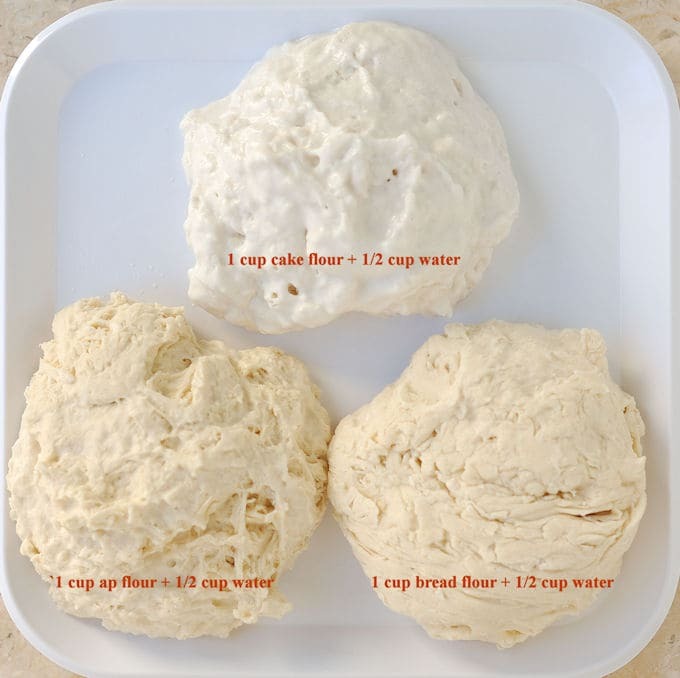 This is why a bread dough that starts out loose and “shaggy” becomes smooth and silky as it is kneaded. This is also why over-mixing batter will give you tough pancakes or a dense cake. “Spring Wheat” is high in protein and low in starch. When this high protein wheat is milled, the hard kernels break into large chunks that will form a strong gluten network when they come in contact with water. “Winter Wheat” has a lower protein content and higher starch content. When low protein wheat is milled, the soft kernels break into very fine particles. Winter wheat produces a fine and silky flour that forms a weak gluten network when it comes in contact with water. Bread flour contains more of the high protein spring wheat and cake flour contains more of the low protein winter wheat. All purpose flour is a mix of both types of wheat and has a medium protein content. Whole wheat flour is similar in protein content to all-purpose flour, but the bran and germ are left in the flour. An equal volume of two different flours may not be equal by weight. For example, one cup of cake flour weighs about 4.25-4.5 oz and 1 cup of bread flour weighs about 5.25-5.5 oz (using the “dip and sweep” method). Those differences are important to remember if you switch out one type of flour for another in a recipe that uses volume measurement rather than weight measurement. If you learn only one thing from this class I hope it is this; bread flour, cake flour and all purpose flour are not interchangeable! Use bread flour when you want a tight and chewy crumb (bread or pizza!). 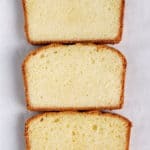 Use cake flour when you want a soft and tender crumb (pound cake!). Use all purpose flour when you want an in-between texture (muffins or cookies!). 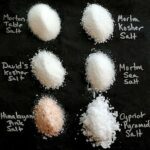 Gluten-free recipes use non-wheat flours that don’t contain gluten. 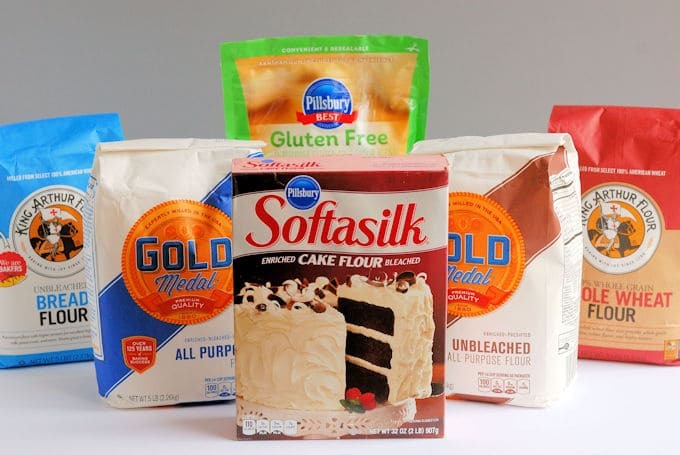 When using gluten-free flour, a binding agent must be added to the batter to replace the elasticity lost without the presence of the wheat flour protein. I have used a commercial gluten-free flour which contains rice flour, potato starch, pea fiber, tapioca starch and xanthan gum. 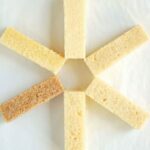 The xanthan gum acts as a binder to replace the structure provided by wheat gluten. Without gluten the structure is weaker so a gluten-free baked good usually won’t rise as high as one made with wheat flour. Cakes made with Gluten-Free flour but different ways of mixing. 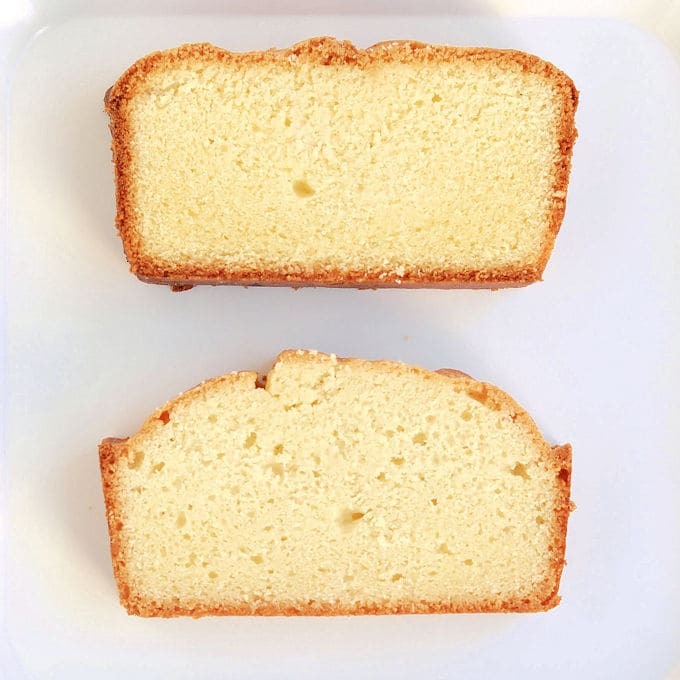 If you can’t eat gluten but love cake, you’ll find a great recipe for Improved Gluten Free Pound cake in my ebook Pound Cake Perfection. 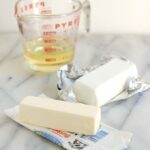 I wish to make scones, can I use gluten free flour without adding anything else to the recipe? Hi Lauri. I haven’t tried making my scones recipe with gluten free flour. I imagine they’ll bake up flatter than usual and will probably spread a bit. You’d have to play with the recipe a little to get it to work. Using gluten free flour I double you’ll be able to cut scones like a biscuit and have them rise up straight. I looked the the King Arthur flour website and they have a recipe for gluten free scones that uses gluten free flour plus extra xanthan gum. Good luck. Thanks Eileen. I think I will try the recipe as is first since I haven’t made scones before. Happy rainy day to you! Yes, it’s a very rainy day here. Thanks, Xelita. Good luck with your research.